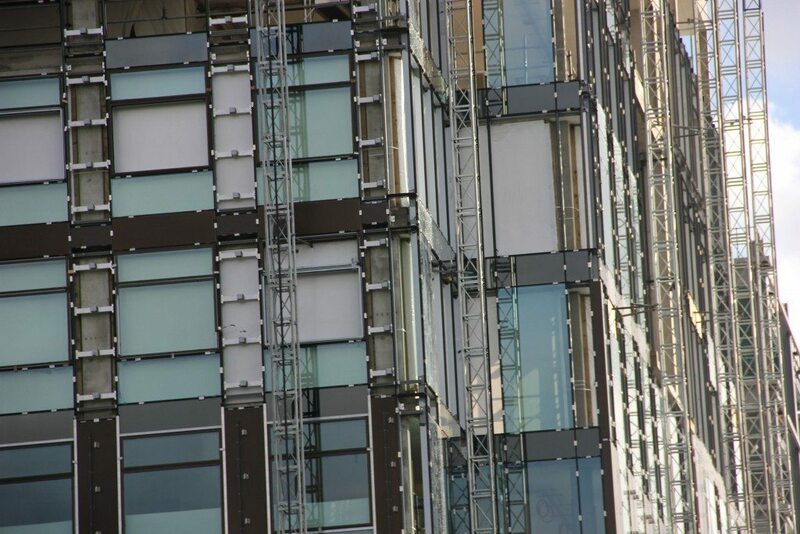 Building screens describes the use of shrink wrap sheeting to encapsulate a building or construction project where there is no scaffolding structure to attach to. 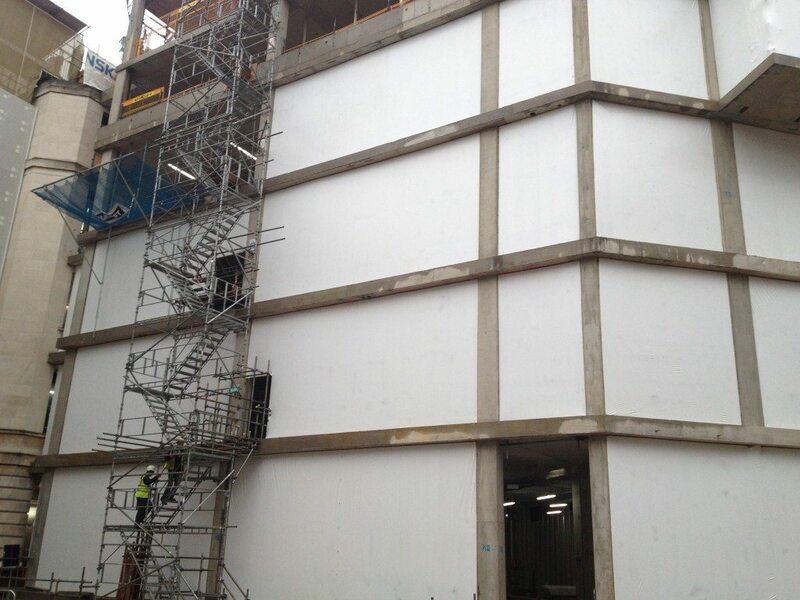 Rhino Wrap supply and install flame retardant temporary building screens which enable large and high rise construction projects to be completed on time and on budget by providing total weather protection & environmental containment prior to fixing of final exterior cladding. Our external building screen products are unique because they can be attached directly to the reinforced concrete or steel building frame and require no additional scaffolding support. Interior fit out prior to fixing of final external cladding. (Prevent project overruns). Good local relationships (Stop dust and debris complaints). Privacy for projects in urban areas (+ highly professional appearance). Safer work environment for on site personnel. Why consider a shrink wrap building screen? Minimise delays & downtime. 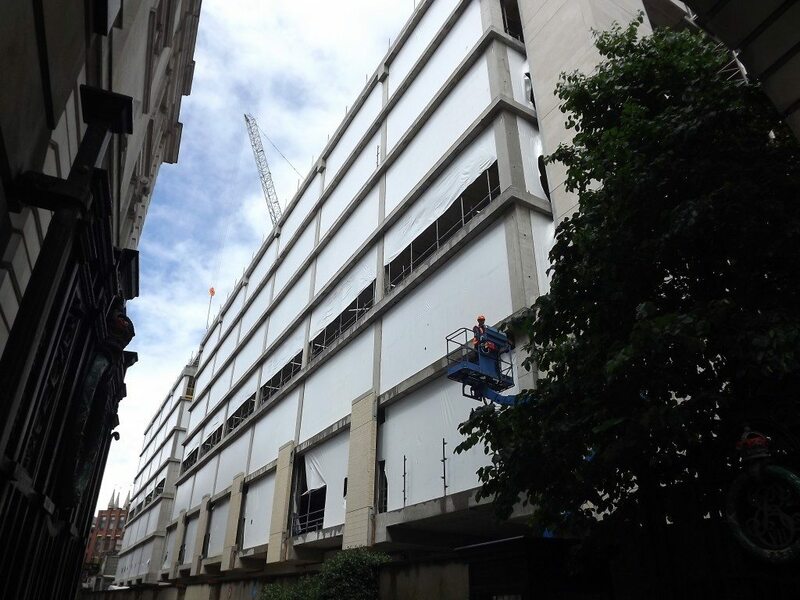 Using a Rhino temporary building screen allows interior works to commence prior to fixing of final external cladding. This can greatly reduce the problem of project overruns and associated costs. Minimise complaints.Our customers tell us that using a Rhino building screen reduces complaints from neighbours, particularly complaints that relate to dust, noise and privacy. Professional appearance. A Rhino exterior building screen does not look like any other type of temporary sheeting. The smooth white finish looks smart and professional and because it fits ‘drum tight’, it is extremely resistant to high winds. Safer working environment. By sealing the exterior of the building as it is erected floor by floor, a safer work environment is created for all on site workers and visitors. Dust does not move around the site and the working area stays dry. The Barts and The London NHS Trust commissioned Skanska to manage and redevelop St Bartholomew’s Hospital and The Royal London Hospital. The project involved the construction of two new hospitals in Central London at a contract value of £1 billion – one of the largest ever public-private partnerships in Europe. The scheme comprised construction of a new concrete framed building and three towers ranging from 10 to 18 floors. 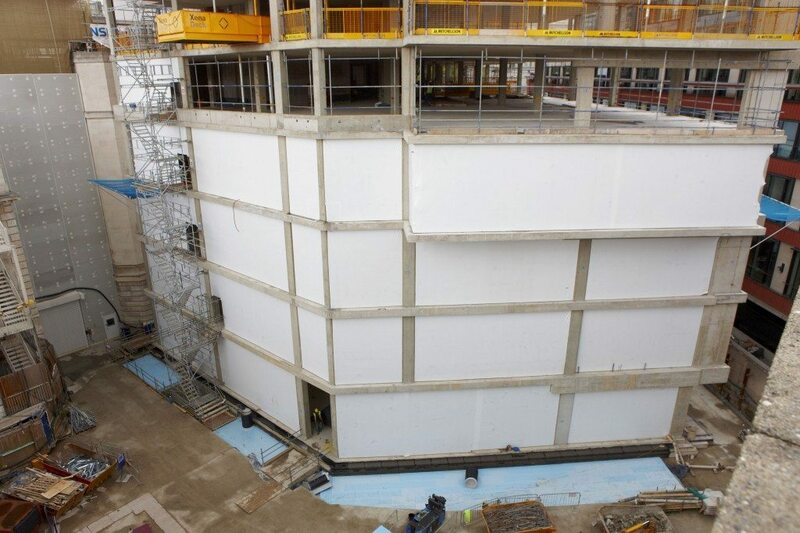 Skanska approached Rhino Shrink Wrap to find a way of providing weather protection before the concrete frame and external cladding is finished, to enable internal building work to start ahead of schedule. 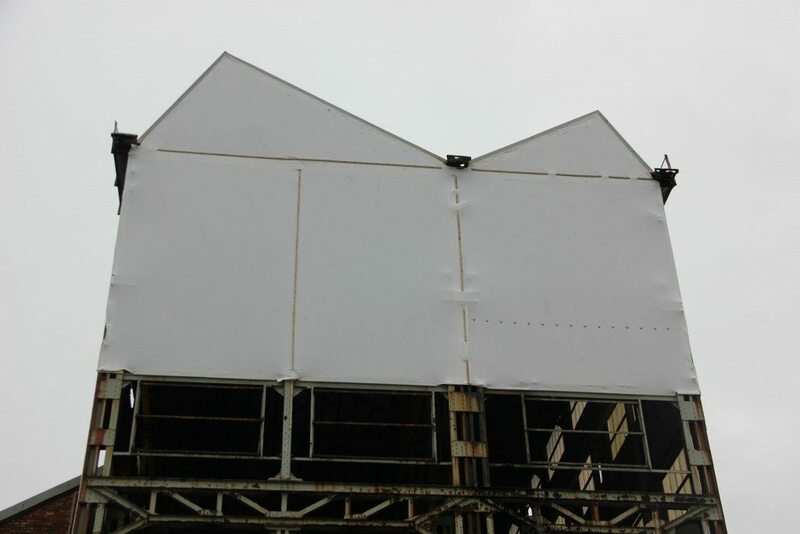 Normal practice for temporary sheeting would be to erect a scaffold and attach the sheeting to that, however, for this project we battened our 300µm flame retardant Verisafe® sheeting around each individual opening in the RC frame and then heat shrunk the plastic ‘drum tight’ to achieve a complete seal. By encapsulating the building floor by floor in this way, we were able to create a weather tight envelope which enabled internal work to move ahead of schedule subsequently making huge savings from a cost perspective but also reducing the risk of down time and overrun fees. 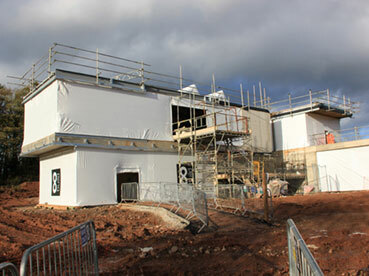 As the buildings external cladding was applied, the Rhino Verisafe shrink wrap sheeting was removed in sections and collected for recycling. 5 Pancras Square, which completed in June 2014, is a 14 storey building which provides the administrative headquarters for the London Borough of Camden and provides a new community facility for King’s Cross. 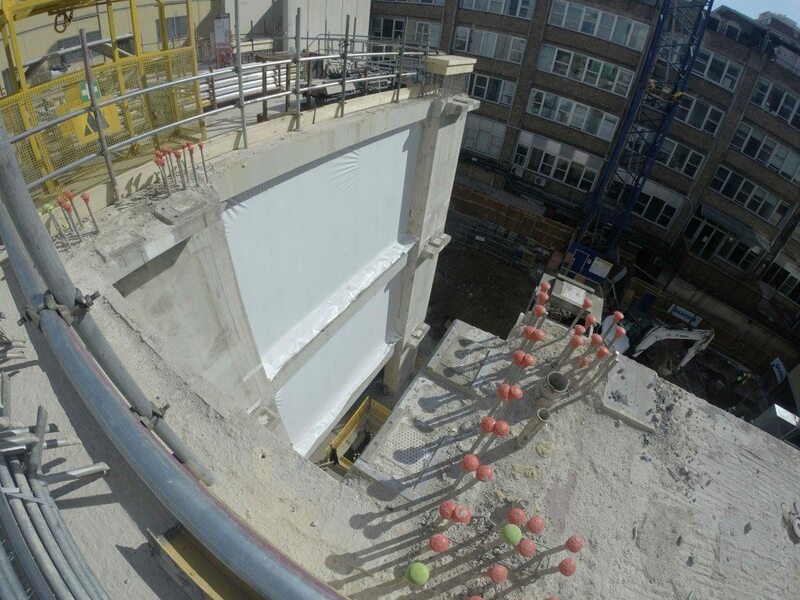 After the initial construction phase of the reinforced concrete frame, our client looked for a weather protection solution that would enable work to continue prior to the installation of the exterior building cladding. To erect scaffolding around the 14 storey building and affix traditional scaffold sheeting would have been very costly. Rhino used our ‘signature’ 7m wide shrink tight temporary cladding in conjunction with battens installed into the RC frame to completely encapsulate 9 floors. At joints between sheets, we used heat to weld individual sheets together in order to create a complete seal around the RC frame which allowed construction to continue without risk of delays due to bad weather. How much do building screens cost? The cost of shrink wrap sheeting will depend on the flame retardant grade (EN1501 or LPS1215) and the quantity supplied (less than or more than a full pallet quantity). We advise that, as a guide, sheeting ‘supply only’ costs from £1.35/m2 and ‘fully fitted’ building screens costs from £6/m2. How do I dispose of shrink wrap building screens? 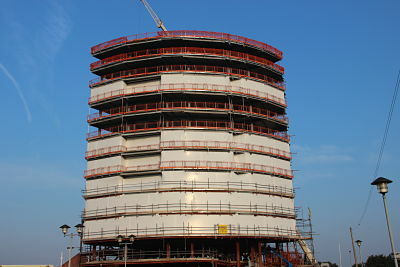 After project completion, the shrink wrap can be cut from the scaffolding and bundled for recycling. Scaffold shrink wrap is much easier to recycle than traditional scaffold sheeting because it does not have any extra reinforcing, eyelets etc. to contaminate it.